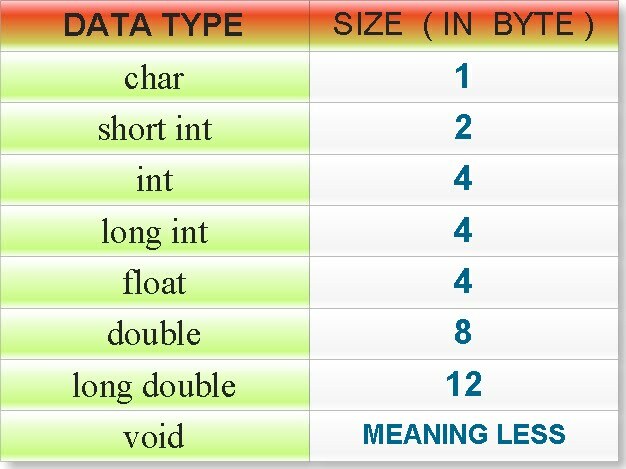 Data types are a vital component in any programming language, however, most people just take them for granted and don't really understand what they are or how they work. A type can be defined as a set of permitted values and a set of operations permitted on these values. Programming languages tend to have many different types, and they vary in their methods for handling them. The compiler also handles the two type systems differently. In statically typed programs type checking is done at compile time, whereas in dynamically typed programs it is done at runtime. As well as having a type system, a compiler also supports many different types and usually provides a method for converting one type to another. There is also a multitude of different programming styles when it comes to dealing with types. Primitive data types are types that generally have hardware support and/or are built directly into the language. Some examples of common primitive types are: integers, floating point numbers, characters and Boolean values. Other additional data types such as strings and arrays are considered complex data types. Ordinal Types are those that have a fixed sequence. "Integer" is an example of an ordinal type because any subset of the set of all integers is finite, can be counted, and has a specific order. This cannot be said for floats (e.g. the subset from 10.000000 to 10.000001 has an infinite number of floating point values in between the two end points). Coercion is the process of converting one type to another. Coercion can be done implicitly or explicitly. float x=5; //note that 5 is an integer and x is a float. This is an example of implicit coercion. int x = (int)5.34; //This is called typecasting which is explicit coercion. Monomorphism is the concept that a name (i.e. variable, function, struct, etc.) has exactly one type. Polymorphism, however, is the concept that a name can have multiple types. It allows us to explicitly provide many values or implementations of the same concept. There are two common forms of polymorphism seen in programming: Ad Hoc Polymorphism and Parametric Polymorphism (note that there are more than just those two, but these are the most common). Ad Hoc Polymorphism allows us to assign a new operation on a specific type to an existing operator or method. This is done by operator or method overloading. In C++, methods defined with the "virtual" keyword are methods that can be overloaded. //The following is an example of the plus operator overloaded. Programs with parent classes and children that inherit their traits utilize method overloading. This occurs when a program has one main class with virtual methods, and one or more subclasses that extend the definition of those virtual methods. Essentially, this allows for us to have the type of a variable passed into a method as a parameter. This is often known as Generic Programming which is a style of programming in which the types associated with data are specified by the program when necessary. This can be done using templates in C++. Following is a sample of functions that all have exactly the same body. The only difference is the type of data in the vector. Note: you want to put the template declaration in the .h file. In the above code, elemType is the name of the variable representing a type. This subject of types, type systems, and programming styles can go on and on. This article only touches the tip of the iceberg, but it provides an explanation for the basic details. Understanding types and how the compiler handles them can help very much to improve your programming skills and efficiency. Once you've reached a basic understanding of types you can easily expand upon it. Simply search for any of the material mentioned above and you'll find hundreds of insightful sources.